A sports car with all-wheel drive is the first choice for more than one in three Porsche 911 buyers. With the new 911 Carrera 4 and 911 Targa 4, you profit from an increase in sporting characteristics and comfort. The innovative turbocharged engines are more powerful and consume less, with the improved all-wheel drive increasing dynamics and driving safety. In addition, the adaptive PASM chassis (Porsche Active Suspension Management) with its ten-millimetre lower ride height included as standard enables an even greater spread between sporty circuit and relaxed long-distance driving. Rear-axle steering that is available as an option for the Carrera 4S models further increases the dynamic spectrum considerably. Interior functionality is enhanced by the standard-feature Porsche Communication (PCM) connectivity and infotainment system with simplified operation and multi-touch display. Behind the re-engineered flat engines are more than four decades of Porsche experience with turbocharged engines from motor racing and production sports car. The result is that all new 911 Carrera models impress with top values in terms of performance, driving fun and efficiency. 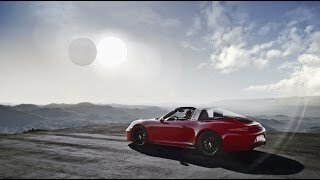 Thanks to bi-turbocharging, the three-litre, six-cylinder engines in the 911 Carrera 4 and 911 Targa 4 achieve an output of 272 kW (370 hp, Combined fuel consumption 8.7-7.7 l/100 km; CO2 emissions 201-180 g/km) and a torque of 450 Nm, while output in the S models increases to 309 kW (420 hp, Combined fuel consumption 8.9-7.9 l/100 km; CO2 emissions 204-184 g/km) and torque to 500 Nm. This gives the driver an added bonus of 15 kW (20 hp) of dynamic performance to convert into driving fun. The greater power of the Carrera S models comes from turbochargers with modified compressors, a specific exhaust system and tuned engine management. the 911 Carrera 4 for the first time even achieves better acceleration values than its rear-wheel-drive counterparts. Equipped with the options of PDK and Sport Chrono package, the 911 Carrera 4 sprints from zero to 100 km/h in 4.1 seconds (0.4 seconds less than its predecessor model), with the S model registering 3.8 seconds (0.3 seconds less). The cabriolet S and the 911 Targa 4 with comparable equipment need just 0.2 seconds longer – the time it takes to blink. Top speeds vary according to model and equipment between 287 km/h and 305 km/h. 911 Targa 4S, each with PDK, in which average consumption falls by 1.2 litres to 8.0 l/100km. The new Porsche 911 Carrera 4 and 911 Targa 4 will be launched in Germany as from the end of January 2016. The 911 has enthralled Matthias Braun, General Secretary of the AvD. A silver Porsche 911 Carrera 4, model year 1989, was the last Porsche vehicle driven by Louise Piëch. What moves Fernando Guerra is found in a garage in Lisbon: four classic Porsche models from the years 1973 to 1995.